Team Slot are still a long way down the road when it comes to slotcar making but compared to what we could buy ten or so years ago they are catching up. I don’t know if they will ever equal the like of Scalextric and co for all round finish and drivability but if my latest acquisition is indicative of a trend then they will be a lot closer to the market leaders in a couple of years! 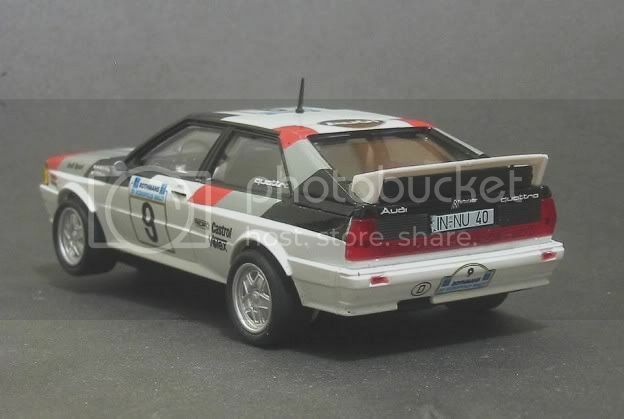 My first Team Slot experience was the ill fated Toyota Celica GT4 (see review, this board) It wasn’t a disappointment as I had no expectations of it but it certainly let itself down badly. My next Team Slot experience was the Renault Alpine Rally car in factory colours. This model took a bit of working on but eventually at minimal cost I turned it into a race winner. The TS 6 motor was far more tractable for small track / home circuit use. 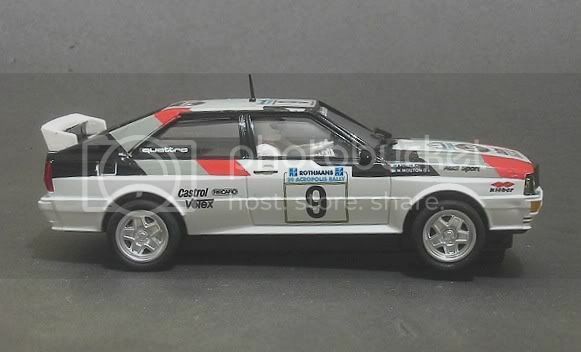 A few weeks back whilst perusing the pages of John Hayward’s ‘Classic slot’ web site I saw the Audi Quattro ‘Acropolis Rally’ model. 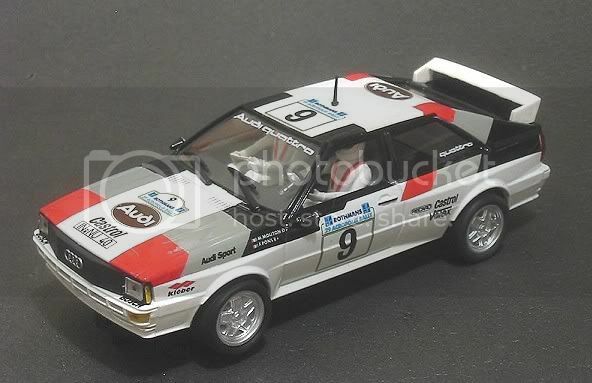 My previous experience with Quattros was the Scalextric model. Very attractive but very, very hard to drive. 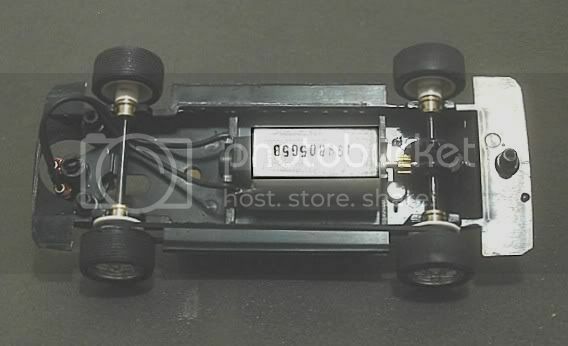 Like a lot of the earlier Scalextric saloon/sedan car models, there is a lot of weight above the axles and the end result is a model which does spectacular roll over deslots!! So, apart from a little trepidation, not knowing what motor it would have and how good the body and chassis mouldings would be and whilst waiting for some of the more desirable announcements from other manufacturers to materialise, I decided to purchase this model with a view to getting it ‘working’. As an overseas buyer, EU rules allow me to purchase this model free of VAT (GST) and at 17.5% this makes the model very attractive. Aussie customs and excise rules allow non commercial transactions below $200 exempt from duty, so this too was very attractive!! And finally, after a Paypal transaction of Au$55.00, the model was on its way. Five days later, I was eagerly unwrapping it in the comfort of my lounge. Out of the box my first instinct was to whip it over and view the motor, as expected, it was the TS7 Titan!! A mean beast with plenty of sting. Not really a home track / small track motor but in a good chassis it can be partially tamed. Further inspection of the exterior showed the finish to be greatly improved on the GT4. No tampo fading out towards the edges and no over spraying of other parts. The axles, too, felt fairly firm in their bushes and the body detail is a vast improvement on my previous experiences with Team slot. One thing that caught my attention was the rear end detail. No doubt the soon to be released Fly version will have a well moulded rear end but, for Teamslot, this is a milestone in detail reproduction!! Another plus was that the model actually sits level on its chassis and is square to the track. The other Teamslots I’ve owned have had their mounting posts trimmed to get things level! Almost worth the purchase alone! Looking closer, some of the not so hot features become apparent but hey, this is to race!! The model has quite a heavy clear coat on it, maybe one too many, and wherever the model is sprayed, I think they should improve the dust extraction equipment. There are specs of dust or fall out in several noticeable places on the upper body. Another area for review must be the moulding itself. 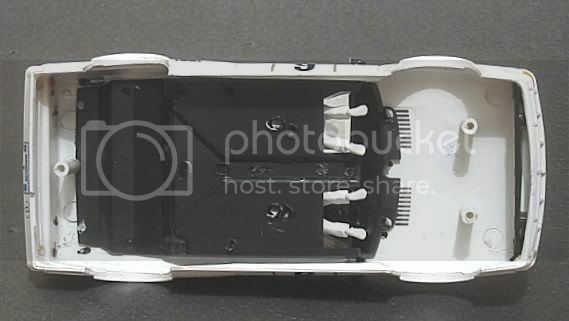 It looks scale enough and in good proportion but like some of the static plastic models of the sixties and seventies, there are ‘dimples’ in the moulding at the extremities, front and rear. Minor, but still there. The driver and navigator are pretty nineties and interior detail for this in line model is rudimentary but it does well in conveying the visual effect of the original. The colour scheme too is a fair likeness and with red and black parts being very bold, it stands out in a crowd on the track! Lastly, the vulnerable parts consist of both door mirrors, as they stick out into the roll over zone, and the rear spoiler comes across as a bit flimsy but it does have a simulated oil cooler mounted in it so this may well brace it a bit! Next job was to poke about inside a bit. Three tight screws fix the body. Two up front and one rear. The mounting posts don’t interlock with the chassis as do a lot of modern models so it is up to the chassis to sit between the body sides to hold all in place. This will make body tuning a breeze. The model is four wheel drive, this is a bit tongue in cheek as the front wheels are driven by a familiar rubber band on one side only. The belt tension is quite low and its effectiveness will have to be tested. I usually test this sort of set up by turning the front wheels. A good set up will turn the rear axle too but this system slips easily and power transmission from rear to front looks like it’s going to be rudimentary! Also, on later inspection, it was noted that the front pulley was actually split on the shaft!! The sloppy belt is probably a blessing in disguise as any more tension on the pulley may well be problematic. Next check was the guide. This is similar to other team slot ‘spring loaded’ guides. Not too much tension here either and it is a poor attempt at a spring loaded guide. The saving grace is that the guide is quite rigid in its mounting and front/back and side to side slop is minimal. Next, to the motor. This sits in an adapter. 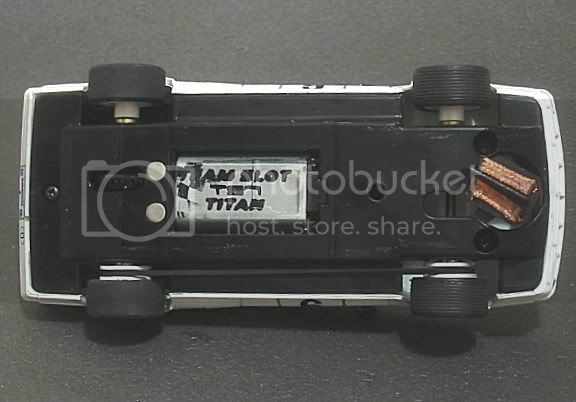 The TS7 Titan is externally the same as the Ninco NC 5 motors in appearance and the hole in the chassis is quite large? The end result is a motor that has virtually no resistance to torque reaction what so ever! The motor will eventually have a thick bead of hot glue down both sides to stop this twisting. The front and rear axles are fairly well mounted and axle/bush slop is minimal although the axle bushes do rotate readily in the chassis. My solution here was to fix the rear axle bushes with some PVA glue. This will do the job well and will be easy to release when it is necessary. The chassis is a loose fit in the body so there are no pinch points which might need treatment. Tyres are not the best. They are eccentric and have poor grip. My previous experience with Teamslot tyres has been to discard the rears and replace them with SCX type seven slicks. These seem to have plenty of grip for both board and plastic tracks. The wheels on the other hand are fine (this time) and don’t have any noticeable eccentricity or run out. A saving grace on a model that is going to take some setting up. The model’s first outing was at a friends classic Scaley layout but this was more a try it and see event. It wasn’t possible to run the car flat out as the undulations in the plastic track caused the model to become airborne after reaching Mach 2! The traction magnet did however demonstrate more that a token amount of downforce. Not of SCX or Scaley proportions but still enough to allow the car to hang on fairly tenaciously in even the tight radius bends! Another observation was the noise emitted from the gears, very reminiscent of SCX models! So later, after screwing gluing and lubing, next stop had to be the 21 metre painted board test track. At home with the Red Team saw the model wheeled out for its debut. Track warmed up and ready to go, the model was placed in red lane and given its head. The track had already been ‘warmed up’ and a few moderate laps gave me an idea of what to expect under pressure. Pressing on, I decided to run the model on full power. The track has the facility to ‘dial in’ some wire wound resistors and therefore either tame or handicap a model. On full juice I set off and it was immediately clear that the SCX tyres were working well. With the gear still a bit noisy I pressed on but it did quieten over a period having not been lubed to start with. After twenty laps or so I decided to up the pace. Make no mistake, the TS7 ‘Titan’ motor has plenty of grunt. In my Celica GT4 test it made the car almost undrivable, due in part to the poor chassis. This model retained a semblance of controllability but the car is still blisteringly quick. Too quick for the average home circuit. It would be more useable on a big club circuit and then it will be a handful, the main reason being the cars high centre of gravity. I punched out a few unnerving laps and finally, the tyres bedded in well and the extra grip caused a tipping deslot in the sweepers. C of G was going to need attention still though. 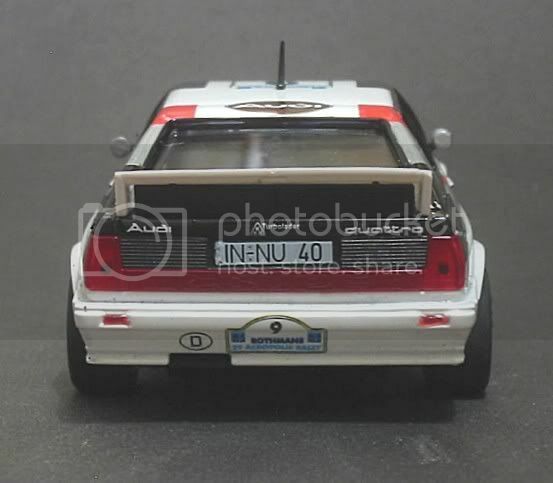 The ‘yump’ on the back straight caused the model to become airborne but in this cars case, nine out of ten times it landed back in the slot??!! allowing me to continue on my breakneck way! Finally, I reset the race manager and pushed of for the hottest lap. Hold on to your seats! The model flies, it is possible to control it but every corner is a potential off and you can’t run that high speed ‘relaxed’ type of race. It’s ragged ‘edge’ every time! This model should be raced with lane stickers top AND bottom! After a period of high speed passes, best time was 7.643 secs, My next step was to clean the tyres and set off again. With a light smear of CRC (WD40) on the rear rears, the grip level seems to increase dramatically but as mentioned before, the high centre of gravity may well work against having too much grip and corners had to be notched back a bit. Nonetheless, the model is a very quick car and after final testing, the best lap came in at 7.216 secs. No slouch at that but still no time to relax! Front Axle width				59.5 m.m. Rear Axle width (SCX tyres)	        	62.0 m.m. Rear wheel diameter				19.0 m.m. I have been pleasantly surprised by this model although I still maintain that it would be a better car with something a little less lively under the bonnet. If you have a stable of quick cars then your controllers will hopefully be matched to them but if you are using set controllers at 60 and 70 ohms then expect to have reduced control of this model and in the extreme you can expect to burn one out. Ideally, this model needs a 25 / 45 ohm controller for best results depending on the circuit. I will possibly keep this model at least for a while, if only to burn off the Fly models on our local board tracks when they arrive!! With the arrival of the Scaley Lancia Group B rally cars, an event was called locally requiring all those taking part to drive one of said Group B's to the best of their ability, the event was part of the local Q32 race group and was held on the revived 'Nerangbaring' circuit at Strathpine in the northern suburb of Brisbane. I had arrived a couple of hours early as the track was still having some teething troubles and my person was required to lick it into shape, which took an hour or so. With time in hand I decided to test the class cars for the day being NC1 touring cars, Group B rally and JGTC's. I had taken three models for the Group B event, one was the Teamslot Lancia Stratos (review this board) which had a BWA NC1 replacement motor, the next model was the SCX Lancia Delta Integrale which I have had for several years but had not raced for a long time, then there was the slightly optimistic Teamslot Audi A 4, an as yet unproven model. Practice started with the Lancia and all was going well but it wasn't displaying winning attributes; it was running well....as well as others Gp B's but not exceptional. The model retained its four wheel drive and I had fitted slightly oversize 'MJK' urethanes to the front to improve cornering but I fear the campaign hardened RX81 motor had no more spirit in it and was therefore no longer fit for active service. The Lancia Stratos was an improvement, and on the part-fast, part-technical circuit it was still a couple of tenths off the pace, even though the much under rated BWA NC1 replacement motor was a gutsy drive. But no matter how hard I pushed it it would not crack the six second barrier. So looking at the Audi and thinking "Oh God!" what have I done I put it on the track. Prior to this and some time ago I had already changed the motor for one of the Team Slot lower speed Boxer motors and considered it fairly well tamed. Practice revealed a couple of minor annoying traits but a little extra weight was added underneath and the tyres were trued on my emery board. Taking it onto the track and pushing off fairly moderately the model lapped in the high fives to 6 second mark but full concentration was required to keep it on the black stuff; and there were more than several laps cobbled together where I could not do an uninterrupted circuit! But there was to be divine intervention of a sort. While fixing the computer, the host had plied me with a rather nice red looking substance which had come from stranger parts where the fruits grow in endless straight lines! As it happened, by the time the first glass was empty, a second was charged and the Group B class was only minutes away from being run. By now I was feeling relaxed to the point of euphoria and by the time my race was due I would have raced a plastic duck with a wind-up motor! A couple of laps put the wind up me so I backed off a bit and focused on staying on. To my surprise this was proving easier the more empty my glass became up to the juncture where all the heats were run and the race concluded and results were disseminated! Lo, lo, and thrice lo, the valiant Audi had come home at the head of the 16 man pack, not the quickest on the track; I believe that went to a hard driven MSC Metro if I'm correct; but the law of averages came good and the price for staying on and staying out of trouble had paid off, and a somewhat worse for wear driver and his prodigal slotcar had won the event! For the life of me there must be a moral somewhere but I can't see it just at the moment! So, there is a devine entity and if you too play your cards right and most importantly KEEP YOUR COOL! you too may also be able to surprise yourself....and possibly the competition!